Home / News / Oneplus / Smartphones / OnePlus 6 Specifications and Images Leaked Online! 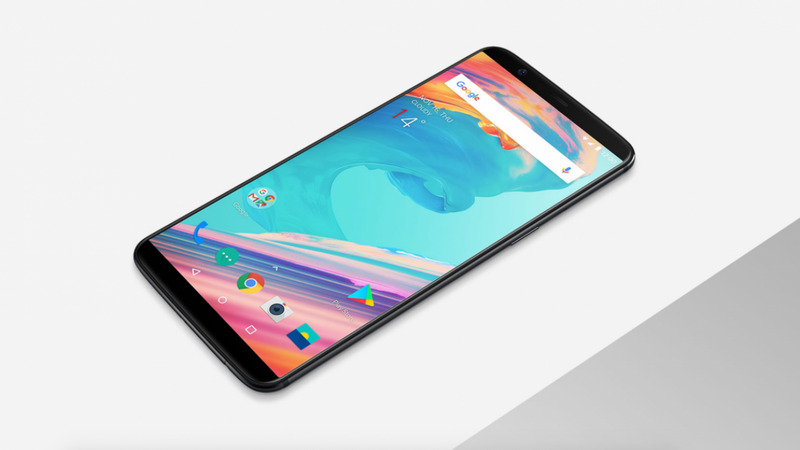 OnePlus 6 Specifications and Images Leaked Online! In past few weeks, a huge suspense is created all over the world regarding the OnePlus's next flagship OnePlus 6. An image of the OnePlus 6 in hands was leaked some days ago. Not only an image but so many leaks and rumors about the specifications and the design of the smartphone are leaked since the start of 2018. 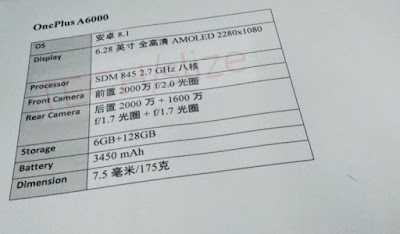 Although all the leaks are not very confirmed but after going through all those leaks and a recently leaked image of specifications of OnePlus 6, here is a nearly perfect report regarding the specifications of OnePlus 6. We hope that this will help you. OnePlus is ready to launch its next phone OnePlus 6. According to the leaks, the OnePlus 6 will feature a 6.28-inch AMOLED display with a resolution of 2280 × 1080 pixels and an aspect ratio of 19:9. The design of the smartphone should include a metal body with a notch on the top. 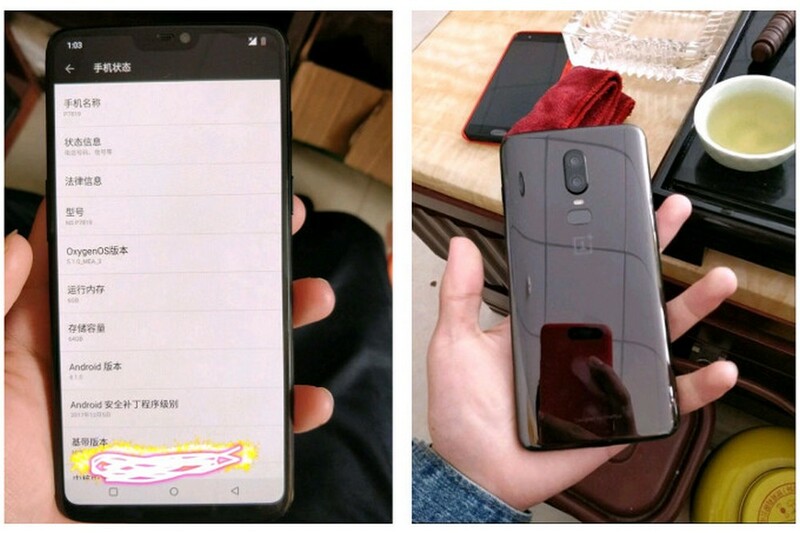 The OnePlus 6 is looking a bit different compared to its predecessors in the leaked images. At the back, it will have dual vertical cameras with a fingerprint sensor under them. The phone is also expected to come with Corning Gorilla glass protection. The Android Oreo software will operate the new OnePlus 6. The handset is expected to be powered by a 2.8GHz Qualcomm Snapdragon 845 processor. The storage features of the smartphone will comprise two variants: one with 6GB RAM and 128GB internal storage and another one with 8GB RAM and 256GB internal storage. The OnePlus 6 will pack dual primary cameras 20MP+16MP with the f/1.7 aperture which is vertically striped at the rear. The front camera of the phone will include a 20-megapixel sensor with f/2.0 aperture. 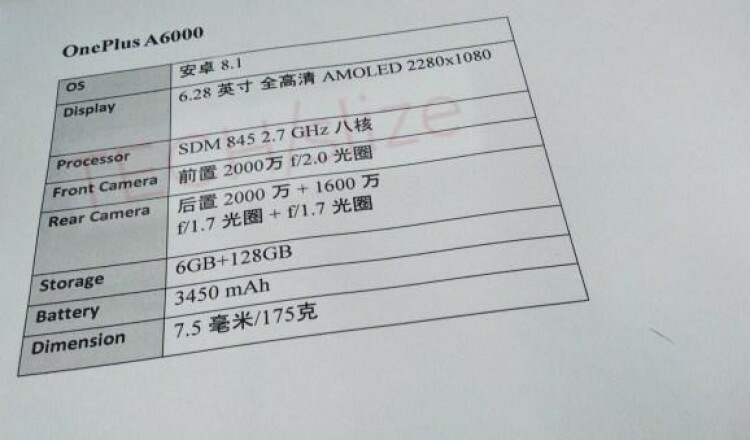 The smartphone is expected to run by a 3450 mAh non-removable battery. The device will support 4G VoLTE, Bluetooth, Wi-Fi, GPS, etc. It will come with all the sensors like accelerometer, proximity, gyroscope, etc. and a fingerprint scanner at the back. The fingerprint in OnePlus 6 will be quite different from the other OnePlus phones. Most of the previous OnePlus phones had an oval-shaped fingerprint under the display but this one will have an oval-shaped fingerprint sensor at the rear, just like OnePlus 5T. OnePlus 6 may cost around $749 or Rs. 49,000 in India. OnePlus 6 will be available on Amazon to buy and it is sure that this flagship smartphone is going to create a big sale for the OnePlus. The Oneplus 6 is rumored to launch in June 2018. We will update you with next news about OnePlus 6. Stay tuned to Glanceinfo for more such latest news.